What exactly does it mean to repurpose or upcycle? 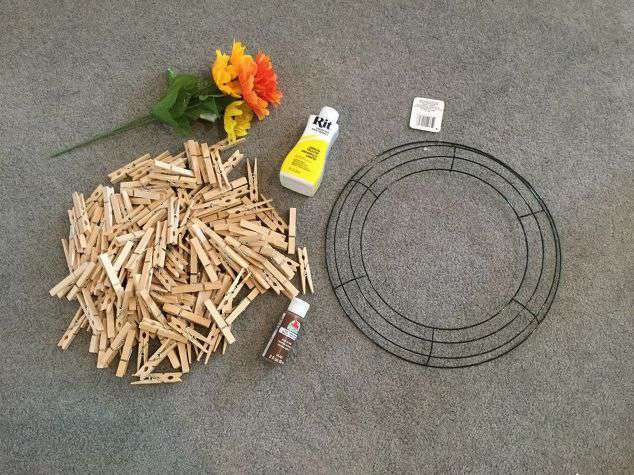 A little Rit Dye, some clothes pins, a wreath form, and a few finishing touches and you have a sunflower wreath. Inexpensive and easy to make! Put your clothes pins in a large bowl or bucket. *For my wreath it is a 14″ frame from Dollar Tree and it took 156 clothespins. Cover the clothespins in water. Add 2 Tablespoons or more of Rit Dye to reach your desired color. Remember to shake the bottle up before pouring. Let them soak for approximately 4 hours. Let the clothes pins dry completely. Mine took a little over 24 hours stacked like this. On your wreath form, clip your clothes pins on the last wire all the way around. For your second layer, clip your clothes pins on the first and second wires all the way around. It’ll look like this after you get all the clothespins on. Paint brown acrylic paint on the the first layer a little over half way. I also made the edges uneven to create that sunflower’s center look. 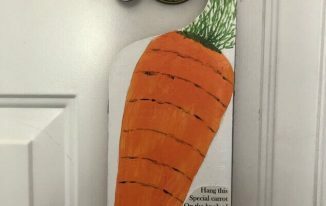 *Optional, if you aren’t up for painting, you could use brown Rit Dye and dye the first circle of clothes pins instead. So you’d have an outer layer of yellow, and a center layer of brown clothespins. 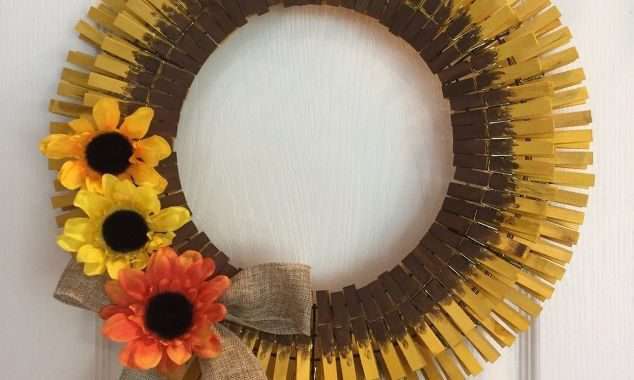 Add a burlap ribbon bow, and pull some sunflower heads off a bouquet and hot glue them onto your wreath. Tie a piece of twine at the top for hanging. Your sunflower wreath is done for you to enjoy. 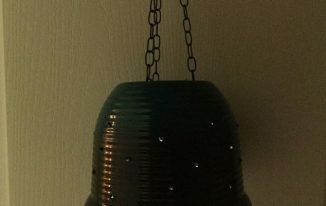 Find out “What Exactly Does It Mean To Repurpose Or Upcycle“, save money, and create the most amazing things. and get my crazy creations delivered straight to you inbox. Never miss a project, update, or latest news! My website is about what I repurpose, upcycle, organize, clean, and hack today. I love to teach, craft, organize, inspire, help, collaborate, and build a community! Simply beautiful, my friend! Happy day to you 🙂 Hugs! Very pretty! Sunflowers have always been a favorite. Perfect for autumn. Visiting from Think Tank Thursday. This is so creative! I once had a bunch of clothespins, but I didn’t know what to do with them. I would have never thought that clothespins could create a wreath! Very cool! What a fabulous idea to use clothes pins!! Love how your wreath turned out! Thank you Sam. I made this wreath last spring and I have had it up the whole time since I like it so much. Fabulous! So many possibilities with this peg idea also, xmas, easter…etc. Thank you and you are so right Fiona. All the holidays, flower colors, sport teams, etc. So much fun with a basic idea. This is such a cute idea for a wreath for fall. Thanks for sharing this at C&C with J&J. Thanks Jess, you are so kind for inviting me to share. Thank you for having a place for all of us to share our ideas. This turned out so beautifully, sunflowers are so lovely. I like the part painted inner ring pegs, the effect is great. What a great effect – I love sunflowers, and this one is really cute! Thanks for sharing with Party in Your PJs! Oh what a great idea! I love your sunflower wreath! Thanks for sharing it at Sew It Cook It Craft It. I like this. I think I’m gonna try this. I can’t afford enough of the deco mesh to make the wreath I want. Thanks for the idea. 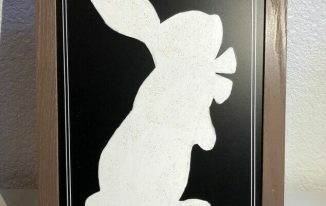 Thank you Ann, I love mine and I have it up all year around. Let me know if you have any questions. How can I get a printed copy. On the computer you could highlight the whole post, right click it and select copy, and then past it on a Word Document. Or you can screen shot the directions and then print that way. GET MY CREATIONS STRAIGHT TO YOUR INBOX, Never miss a project, update, or latest news! Hi, I’m Chas – Welcome to my blog! See what I repurpose, upcycle, clean, organize, and hack today. I love to inspire, help, collaborate, and build a community! GET MY CREATIONS STRAIGHT TO YOUR INBOX!